During the four-day training, members of the Ginggang mountains tour dressed like soldiers of the red army. Viral online photo. 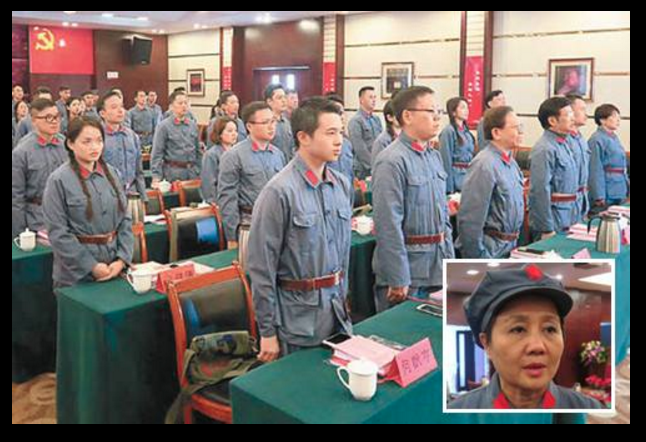 A group of 60 employees from several Macau casinos took a four-day “patriotism training course” last week in the Jinggang Mountains , considered to be the birthplace of the Chinese Communist Party’s Red Army. The trip was coordinated by Beijing's representative in Macau, which is a special administrative region of China with a high degree of autonomy, and was meant to commemorate the 80th anniversary of the Long March , a military retreat by the Red Army during the Chinese Civil War. The casinos publicized the training course, but their odd show of patriotism was not well received — at home or on the mainland. The course is offered by a school called China Executive Leadership Academy, whose major clients are from the corporate sector. Every year, the school gives about 30,000 certificates to graduates of the course, which is composed of a series of site visits, hiking, seminars about the revolutionary history of the Chinese Communist Party. Representatives of the six casino groups, including SJM , MGM , Wynn , Melco PBL , Galaxy , VML , shared their patriotic education experience with the public in a press conference. Tour leader Daniel Fok said he expected participants would bring the spirit of the Chinese revolution, meaning solidarity and the will to victory, back to their personal and professional lives in Macao and spread it like “starting a prairie fire with a single spark” — a popular quote from late Chinese leader Chairman Mao. While the restoration of so-called red culture has become part of the agenda of today's Chinese Communist Party, casino representatives speaking in communist revolutionary language is a rather strange sight, not to mention that about half of the casinos are American and Australian owned. Of course, Macau, a former Portuguese colony handed over to China in 1999, could not have developed into the “Las Vegas of Asia” if the Chinese government had not given a green light to the entrance of foreign casino operators in 2003 and allowed millions of mainland Chinese gambling tourists to visit. With the growth of the gaming industry, Macau’s gross domestic product (GDP) jumped from US $7 billion in 2002 to US $55 billion in 2014, but it has also become a money laundering hub  that facilitates the flight of capital out of mainland China. Mainland China's anti-graft campaign, which began in 2014, has had a negative impact on Macau's casino revenue; Macau’s economy shrank 20% in 2015 and continued to contract in 2016 . As the city’s economy is vulnerable to Beijing’s policies, it might be that the gaming sector sees pledges of loyalty like the patriotism training course as a last resort to save the industry. Gambling and casinos are considered an indecent sector and morally wrong. But this sector is performing a sacred act. It is very difficult for people to accept such a strange performance. No wonder why some netizens said “You’ve ruined the imagine of revolutionary hero”. Though gambling is legal in Macau, you have to respect the law and culture in mainland China. The gaming sector going to the Jinggang Mountains for [patriotism] education has destroyed the atmosphere. Don’t go there anymore in the future! To learn from communist revolutionary heroes, the first thing is to have a purge of the corrupt capitalist bosses like Angel Leung [a key figure representing the gaming sector] for their exploitation of the proletariat. Her property should be confiscated and redistributed to the people. Casinos are the product of corrupt capitalism and against the spirit of the communist revolution. Sorry, there is no communism for anyone to learn in the Jinggang Mountains. It is absolutely appropriate for them to go there to learn the spirit of the thugs.